This might be the first time I've seen a #1/#1. It's hard to believe the 49ers are dominating like they are, but the numbers say they're for real. I didn't have high hopes they'd come very close to last season's 13 wins. It's very difficult for a defense to repeat such a dominant season. I saw their 2011 as a combination of a truly good defense, a low-mistake offense, lots of luck, and a weak schedule--all things unlikely to repeat. It appears the defense may have improved and although the offense may not continue as the #1 squad throughout this year, it's doing a lot more than just avoid mistakes. I'm shocked to see Miami so high up there, but their record really doesn't do them justice. I think this is the first time I've ever seen my Bears, Dolphins, AND 49ers all ranked in the top 10 of anything. The only one that's really bothering my intuition is Denver's defense staying so high after NE seemed to manhandle them this past week. I can understand the loss was due to a lot of stupid turnovers, but that pass defense looked shaky at best. How much confidence do you have in your method for adjusting for strength of schedule? The niners have only played one top 10 team and they lost pretty big. With both their offense and defense almost at the league average, how does Miami get to #5 overall? Their opp GWP is 0.51. The only thing they have that is above average is their PENRATE, but is that enough to lift them up so much? I'm equally baffled that Smith has suddenly become a much better QB. How is he leading the league in Air Yards/Att? As for #1/#1, the 2010 Chargers were #2/#2 after Weeks 16 and 17, so there's a chance they were ranked first in both categories at some point during the year. Interestingly, they had a much higher GWP (0.81) than SF (0.73). I'm guessing that's because SD had the best OPass (SF is only 8th) and the better penalty rates. I based my prediction of 9-7 on the advice of Koko the Monkey. If I'm wrong, I'm gonna hold him -- and you -- responsible, lol. Also the 49ers might look better by this ranking system because this year they've concentrated their resources more in offense this year and less on special teams (since this system doesn't count special teams). They released two special-teams-only experts, Blake Costanzo and Colin Jones, and sure enough their special teams are a lot weaker this year. They made a decision to cut Rock Cartwright, another special teams ace. In their stead they have a slew of new skill-position players who make no contribution on special teams. I'm thinking Harbaugh and Baalke specifically invested in special teams last year because that's a cheap and relatively easy place to improve -- doesn't take an entire off season to coach up a special teams unit. With an actual off-season and a year under their belt, bolstering their complex offense becomes more attractive. Vikings offensive efficiency is misleading. The last 3 games they had the lead early and NEVER at any point in the entire game gave their opponents the lead. So they called a more conservative gameplan once they got the lead. That means shorter passes, more runs, fewer "forced" throws. Regardless, their defense has been incredible. Frank Gore looked "average" against them. Chris Johnson looked terrible against them. Calvin Johnson looked below average against them. Who would have thought? I need to get my picks in for my office football pool by Wednesday evening, yet Brian doesn't post his win probabilities onto the Times site until Thursday mornings. Argh! Is there a mathematical way I can convert these ratings into approximate win probabilities, before Brian's special sauce is added in? Brian-have you ever considered looking at injuries and creating some kind of injury stat? I noticed a stat last year called something like "starter games lost to injury". I'm sure that could be converted into some kind of rate so it can be scaled as the season progresses. 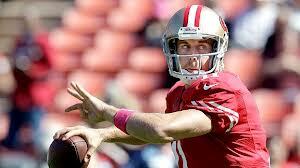 Cause one thing I noticed about the 49ers is the complete and total lack of any key injuries the last two years. And while injuries may be a function of talent (inferior players probably get hurt more because they are physically inferior), they are largely random--and my guess would be they regress to some mean level. And I wonder if they could they be predictive. In other words, if after 5 games of the season, some team has a large % of games/plays lost to injury (maybe convert to a play basis based on some average number of plays per game), I wonder if it would be predictive in a game forecasting model where perhaps a projected rate for the next game is adjusted/weighted based on player status on the injury report--r something to that effect. Not sure if this is something that can be looked at in the historical data, or standardized from any of the league stats (not sure where the starter games lost data is found--I just saw it in an article last season when discussing the relative impact of injuries for teams like the Bills (who had the highest % last year, if memory serves me) relative to the 2010 Packers (who are always referenced as a team that "overcame" injuries--but that perception was based on the # of players on I.R. The reality was that their starting player games lost rate wasn't that high at all)). Ever looked into this or considered it? Why or why not? Anon--you can download the predictor at http://nfl-forecast.com/index.html (Sorry... not sure how to create a hyperlink--maybe it will automatically happen when I hit 'publish'). I believe that can be used as early as today. Same values as published in NYT, as I recall. Someone correct me if I'm wrong about that, but believe it to be true. = .28 vs. .72 So by this formula Sf has 72% chance of winning over NYG at neutral site. Now we need to add a HFA (I can't remember how Brian does it) so lets add ~ 6% (it's around 8% each way! so SF is ~78% this Sunday?! I used it last week and it was pretty close to Brians GP's. If you convert to Spread that's around 10 points. we can see what Brian thinks of this estimate? 60% versus 40% gives a 69% chance. I may be wrong about when that forecaster model is updated with the new weekly stats. A few games look out of whack. So maybe it doesn't get updated until the NYT article. Not sure. Or maybe I'm having trouble with a model that shows TEN being over 50% probably to beat PIT. Ha! Not sure. Someone else will have to answer that question as to when it gets updated. Unknown, Pitt has a 0.42 GWP and Tenn a 0.41 GWP with home field advantage, so over 50% is correct according to the model. It's nice to see my beloved Vikings moving on up the rankings, but I've got to think they are better than ninth if SF is still #1, since the Vikes handled them easily, have not lost since, and absolutely thrashed the Titans last weekend. Also good to see Carolina moving closer to where I estimated they "should" be in my comment on last week's ratings (I said 11 or 12). I'm considering using Miami in a survivor pool this week, and I'm trying to figure out how they can be ranked #5 overall with an O RANK of 15 and a D RANK of 12. Their opponent GWP is 0.51 so that can't be it. Is it all because of their low PENRATE? Where 0.733 accounts for home field advantage. It would probably be better if OFF GWP and DEF GWP were put in the table instead of the ranks since you can't see what the difference is between ranks. The difference between rank 2 vs 15 might be tiny. The ranks could be put in parenthesis. Brian do these rankings factor in the imbalance of home vs away so far in the league? IF team A has played 3 home and two away and team B has played 2 home and three away ? Why is the Falcons offense ranked 18th? According to the graph on the front page, they're neck-and-neck with the Patriots for 1st in EPA/G.